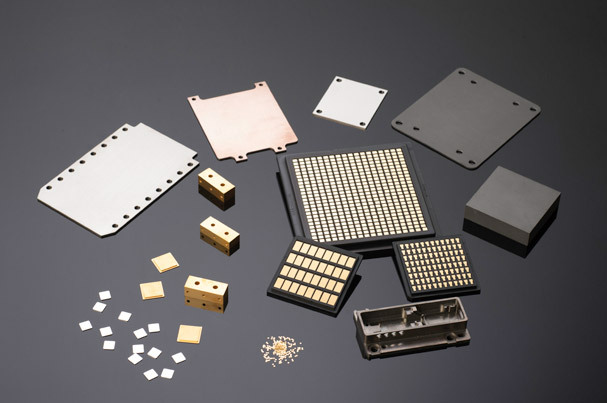 AMETEK SMP Thermal Management Materials are used extensively within the high reliability electronics industry and mainly in Gallium Arsenide (GaAs) and Gallium Nitride (GaN) semiconductors for the defense industry. Our products are trusted in sensitive applications such as advanced active radars, electronic countermeasures, and jamming equipment. Further, our ability to process these materials into net shape and block form allow us to offer these materials for further machining into finished package products. Our CMC and CPC products are processed as turnkey solutions for our customers in much the same way as our blended matrix products. We offer custom sizes through EDM and products delivered with Nadcap accredited plating and packaged in waffle packs.